The 2018 BMW Dallas Marathon weekend of event is in eight weeks. Have you started training? If you can run a 10K (6.2 miles) and have been running consistently for at least the last six weeks, you’re ready to train for a half marathon in eight weeks. Yes, you. I am a 2018 BMW Dallas Marathon Ambassador. All opinions, training advice and training plans are my own. I help runners get ready to race, whether they’re a newbie or experienced, I build training plans to help them cross the finish line strong. I offer both pre-built plans and custom training plans designed to the individual’s fitness and experience level. If you want to run the 2018 BMW Dallas Half Marathon,the time to start training is now. 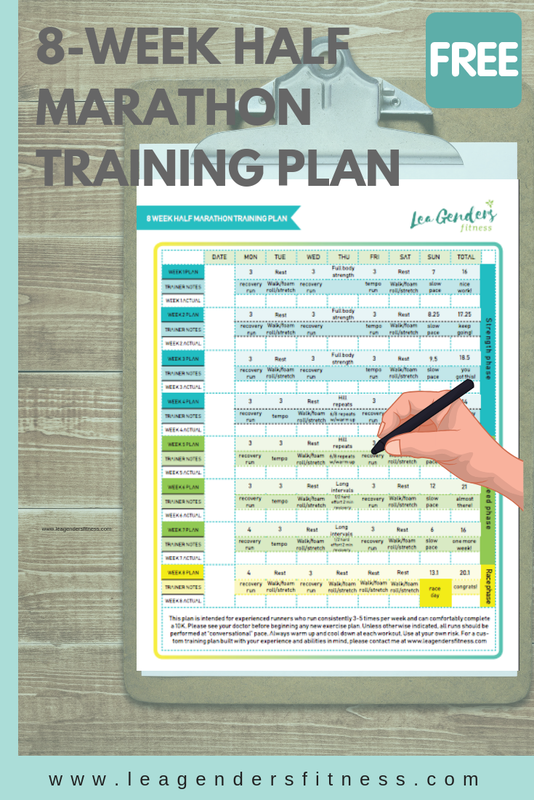 This is a condensed training plan intended for experienced 10K runners who want to train for a half marathon. Please see your doctor before starting any new exercise program. Train at your own risk. Ready? Let’s train! How to build an 8-week half marathon training plan. Save to your favorite running Pinterest board for later. Click here for a printable version of this blog post. No email address required. Arguably the most crucial run of the week during these last eight weeks until race day is the long run. We only have eight weeks, so the long run increases by a mile and a quarter each week, with a couple of step-back weeks with a reduction in mileage for recovery. These shorter long runs at week 4 and week 7 are an essential part of the plan. All long runs in this training cycle should be run at “conversational pace.” That means you should be able to speak full sentences without taking gasps of breath for air between words or phrases. You can recite the alphabet out loud to do the talk test while you run (your neighbors may think you’re crazy). If you’re breathing too heavily, then slow down even more. Sometimes it feels awkward to run this slow but trust the process. Give yourself at least two rest days a week. Training for a half marathon in eight weeks can be hard on your body, and the rest days allows your body to repair and recover, so you come back strong the next day. Don’t neglect rest days, they’re essential in a successful training cycle. You need just one or two speed sessions a week. During this training cycle, we have one tempo run per week. A tempo run is at a “comfortably hard” pace. It’s faster than your conversational speed, but not an all-out-sprint. It’s a pace that you would be able to hold if you were racing for 50 minutes to an hour, often called 10K pace. If you go too fast, you won’t be able to sustain the pace. Learn more about tempo runs here. The last five weeks include hill training and long intervals. Runners who strength train are typically stronger, faster and less prone to injury than runners who don’t. Since you are training for a race that is only eight weeks away, running should be your first priority. I recommend to include a full body strength workout in the first four weeks of this training plan, then as the race gets closer, to replace those sessions with speed work. For best result spend 10-15 minutes before every run performing a short resistance band workout to maintain strength and muscular balance. Recovery runs are done at a slow leisurely pace. I recommend running even slower than you feel you need. Recovery runs trains time on your feet and allows your body to recover from the harder and longer workouts during the week. It’s essential that these runs are done at a slow pace. You become a better runner by running more consistently, these runs help you stay consistent without burning yourself out. Allow your schedule to be flexible. Our lives don’t stop when we are training for a big race. If you have to change your long run from Sunday to Saturday or rearrange your rest days, no problem. Aim to complete 90% of the workouts overall and 100% of the long runs in this plan. No one’s life is so perfect that they never miss a workout, but commit to 90%, and you’ll do great on race day. Most of our body’s recovery processes happen during sleep. That means if you get 7-9 hours of quality sleep per night, you will recover faster and perform better than you would on less sleep. During these next eight weeks, you will be asking a lot from your body. Make sure you are setting yourself for success by giving your body the sleep it needs to recover properly. Try to go to bed and get up at the same time each day for the next eight weeks while you train. Here are more tips on sleep and recovery. Add your email address to download the 8-week half marathon training plan and to receive news and updates from the strength and running blog. If you’d prefer, shoot me an email at Lea(at)leagendersfitness(dot)com and I’ll email it to you. Sign up for the half marathon for the BMW Dallas Marathon. Training starts now. See you there.